In this next section we will help you to prepare your swimmer database, turn on your registration, help you to Email Login Instructions and email a promotion out to all your active and potential parents and athletes. 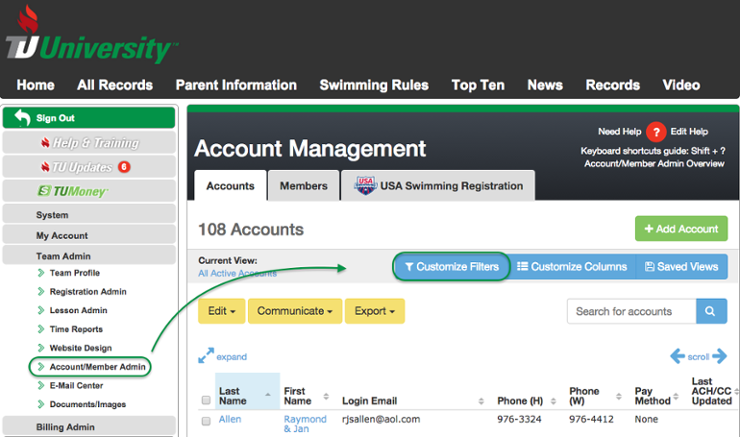 If you are running a new seasonal or new annual Registration, and have no swimmers currently swimming or active, it is a best practice to get your member database prepared for the season. If you still have swimmers in the water or are a year round team with no breaks please skip to the next step. This step involves changing “Active” members’ status to “Waiting for Approval,” which organizes your members for the registration process. This makes managing much easier in the long run, giving you the ability to quickly organize who is returning for the new year and which members are no longer active. 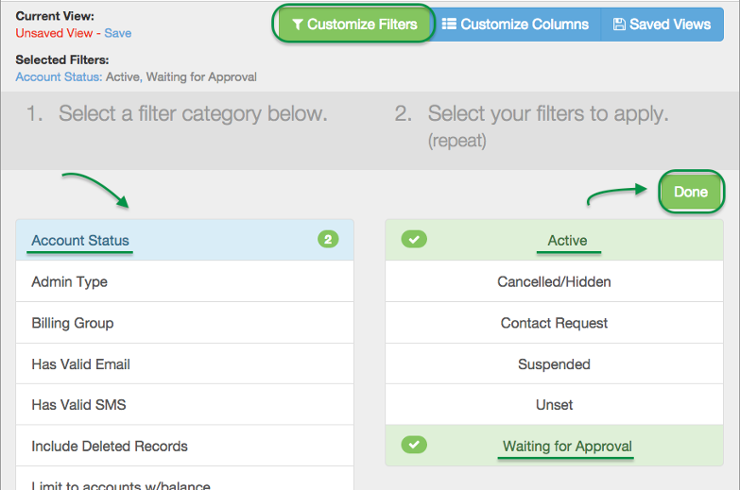 Click Manage by the desired registration. Click Not Registered tab — this will take you to all accounts that have not yet registered. Set the “Member Status” drop down to *Active if needed and click Search. Check the “Change Member Status” check box and select Waiting For Approval from the drop down. Click Save Changes for ALL Members listed NOW. All of your previously registered members are now set to Waiting for Approval. Once the registration process has finished and the season is underway, you can then easily run through these steps again (except you'll set the “Member Status” filter to Waiting for Approval) and move all members who did not register for this season to Suspended. Now that you have tested your system and can see what Parents/Accounts will see, please make any changes to the registration setup you feel necessary. Once those changes are saved, it’s time to get the registrations rolling in. If you turned your Registration off during the testing process, it is time to turn your Registration back ON. Click Team Admin > Registration Admin . Click the current Registration’s Name. Set “Turn on for Registration” to YES. It is also a good idea to look over your registration dates for New and Returning Members to make sure you have them set (back) to your desired registration dates. Once saved make sure again that your registration is Current. It should appear in RED. Many parents have not logged into their accounts for some time if you are a seasonal team or if there is a gap in the season. It is a good idea to email the parents their login information. If you are a brand new team, had us upload your member database, and this is your first registration, you need to do this step as well. Click Team Admin > Account/Member Admin. Select all accounts — Click the check box next to the Last Name column header. The number of accounts at the top of the page should match the number of selected accounts shown in (Blue). 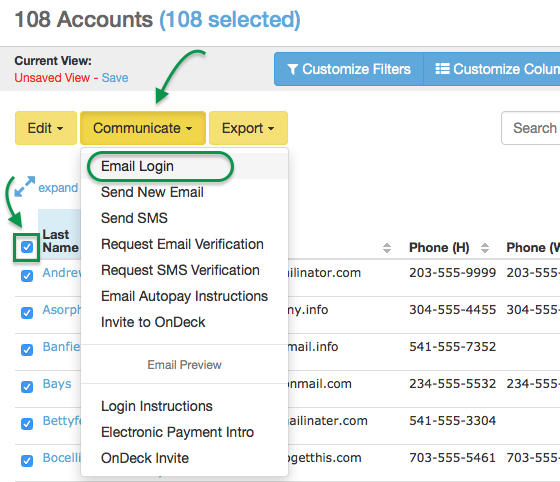 Click Communicate > Email Login, and when the warning appears, make sure you are ready to send email logins and click OK.
You have now sent Login Information to your selected accounts. It is time to promote the registration process to let everyone know when they can register for your team. 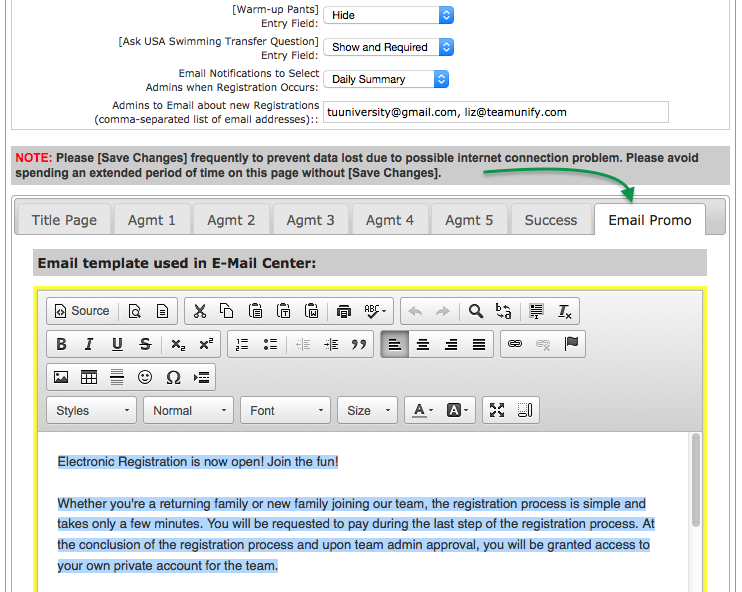 TeamUnify gives admins power to email members and accounts directly from the Manage area of the Online Registration Process. That way you can email accounts and promote your Online Registration, thank accounts/parents for signing their athletes up, and reach out to any accounts who have not signed up yet. 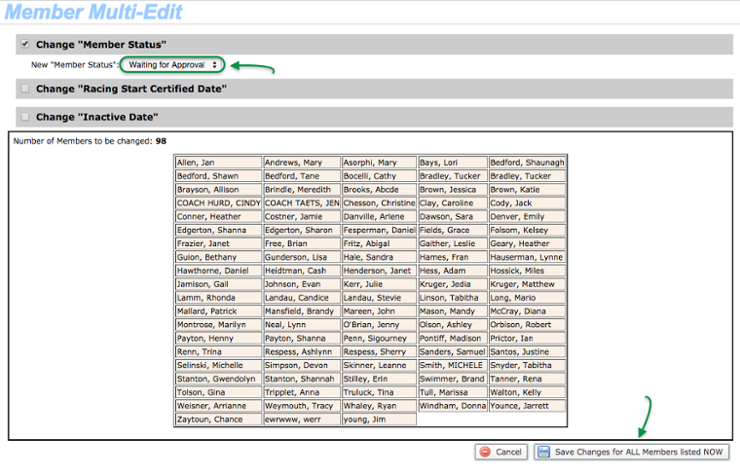 This is a powerful tool and can be used right from your Manage registration dashboard. Go to Team Admin > Registration Admin. Scroll to the bottom and click the Email Promo tab. Click the cursor in the promo text and select all (press Ctrl+A on Windows or Command+A on a Mac). Copy the text (press Ctrl+C on Windows or Command+C on a Mac). Go back to Registration Admin. Find your current registration and click Manage. Click the Not Registered tab at the top of the page. This will take you to all accounts that have not yet registered. Set the “Member Status” drop down to --ALL Non-Canceled-- if needed (or whatever status you would like) and click Search. Select all by clicking the top check box and all accounts should show a blue check mark next to their name. 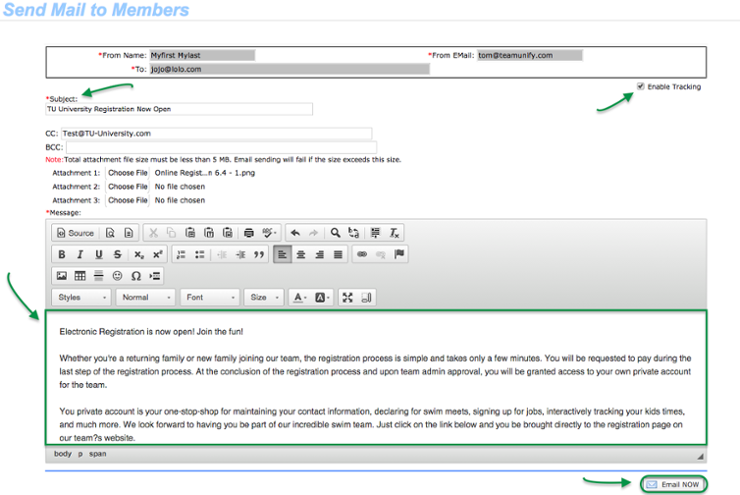 Click Email — the “Send Mail to Members” screen will open. This message will be sent to all accounts selected in the previous step. Fill out your Subject line. On the top right of your screen it is a good idea to Enable Tracking. Check that box and you will be able to track this email in the Email Center. Check your work and click the Email NOW button to send and click OK on the prompt and your email will be sent to all selected accounts. So, you have tested your registration, opened the registration, sent out login instructions and promoted your event. Now the registrations will start pouring in. We will now teach you the last step of the registration process, how to manage your registration. If you need extra help or if you would like to look at TeamUnify best practices for Online Registration please visit the Registration Checklist.